Today we present to you a rather lengthy list of the Signature Abilities in MARVEL’s Contest of Champions, with some explanation of the underlying mechanics. Please leave a comment, if something lacks clarity or precision and we will update this guide. This is an important list for all players, because some of these signature abilities have changed since they first started and players are not notified by that. You should also check out our guide to the amazing Spider-Man for the game MARVEL: Contest of Champions. (When Attacked) Being struck by a critical hit tests Blackagar Boltagon’s restraint, each time increasing either his Attack or Critical Damage by x% for the remainder of the fight. He can gain both buffs from a single hit. Attack is increased up to x% based on stored Power. In addition, blocking partially absorbs energy-based attacks, fueling Captain Marvel’s Power Meter. The more Power she has, the more Attack she has. And, when she blocks L1 and L2 specials, she gains some Power. (All Attacks) Fury fascinates The Destroyer. His builds without limit, increasing Attack by x% with each activation. His Fury buffs can stack. (Special Attacks) A x% chance Gamora’s Godslayer blade deals a lethal blow, striking for massive Critical Hit Damage. Only matters on her L1 and L2 specials. On the L2, each hit can gain the bonus independantly. (Passive) The Supreme Accuser judges the target, punishing them for their use of beneficial effects with x% increased Attack and Stun durations. The ability boosts him depending on the current number of buffs on his opponent. (Passive) Iron Man overloads the Arc Reactor in his chest if Health drops below 15%, briefly extending his life span with a burst of x% Armour and Regeneration. (Passive) Dazing the Thunder God infuriates him, while opponents dazed by the Thunder God become x% more vulnerable targets for “That Which Smashes”. He gains a Fury buff when he is Stunned, and he applies an Armor Break debuff when he Stuns his opponent. (When attacked) Piotr’s organic metal skin shapes and strengthens to his will with no limit, increasing Armour by x% with a fixed chance. His Armor buff can stack (at least once), but it does not refresh the duration of the buff. Also, he can gain the buff when attacking, not only when attacked. 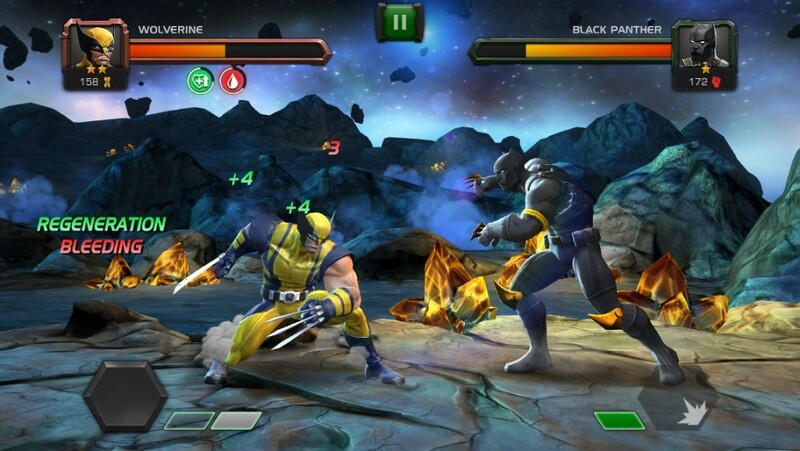 (Passive) As his Combo count increases, Cyclops’ knowledge of the battlefield prevents opponents from blocking him effectively. In addition, his beams reach up to x% additional Critical Damage at high Power levels. The first part of his ability means that some of his blocked Attacks do increased damage (with no upper limit, so they can deal more damage than unblock Attacks at high Combo count). The second part means that his Special Attacks deal more damage. (Passive) Permanently regenerating x% Health per minute was granted when the natural healing factor of Wolverine was implanted into Deadpool. (Special Attacks) As Power surges and flows through her target, so too do her bolts of lightning, dealing x% additional Critical Hit Damage per point of enemy Power. Her Special Attacks deal x% more damage, whether they crit or not. (When Attacked) Wolverine’s natural healing factor accelerates, granting cumulative Regeneration with a fixed chance to recover x% Health. His Regeneration buffs can stack. The Sorcerer Supreme automatically counters enemy Status Effects with beneficial countermagic. Spell effectiveness: x%! Whenever the opponent gets a buff, there’s x% chance Doctor Strange will dispell it after a second or so. The dispell never occurs at a later time. If it is not dispelled in the first second or so of the buff showing up, it won’t be dispelled at all. (All Attacks) The Iron Fists’ repeated strikes to pressure points wreak cumulative havoc on the target’s Armor, with a 20% chance to reduce it by x% for each activation. His Armor Break debuffs can stack. (When Attacked) The impact of enemy attacks is shrugged off with a x% chance…because he’s the Juggernaut. When an attack is shrugged off, the Juggernaut takes damage, but it doesn’t interrupt his own attacks. The ability always procs at the start of a fight. The buff lasts for about 2 seconds, during which attacks don’t interrupt the Juggernaut. (When Attacked) x% chance that Magik teleports into the past to a time before injury. When the ability procs, she has a random chance to regen a fixed amount of Health. (Critical Hits) Whenever a Critical Hit occurs for either player, there’s a x% chance the Scarlet Witch manipulates the outcome for her benefit. When the Scarlet Witch or her opponent deals a Critical Hit, there’s a x% chance that the Scarlet Witch will gain a random buff or that her opponent will gain a random debuff. (When Attacked) Contact with the Abomination’s gamma-irradiated body has a x% chance to Poison the target, reducing their Health recovery by 50% and dealing 60.0% of your Attack as direct damage over 12 seconds. The Poison debuffs can stack. If the opponent is Immune to Poisons, they won’t get the debuff. (Passive) The chance to Perfectly Block all damage increases by up to x% based on lost Health, providing hope when the Cap needs it most. The ability counts all Health missing from the Health bar, even if it was lost in a previous fight. Building Power levels in both players charge the atmosphere, increasing Critical Hit Rate by x% per point of stored Power in both Electro and his opponent. (Passive) Hulk is angered by receiving damage, strengthening his attacks by up to x% based on lost Health. You wouldn’t like him when he’s angry! (Passive) A thick polymer suit enhances Rhino’s gamma-based strength and resilience, increasing his Physical Resistance by x%. (When Attacked) Increased agility coupled with small stature and a sixth sense for imminent danger make Spider-Man x% more elusive. Whenever Spider-Man is attacked (except with a L3 Special), he has x% chance to evade the attack, dodging it completely. 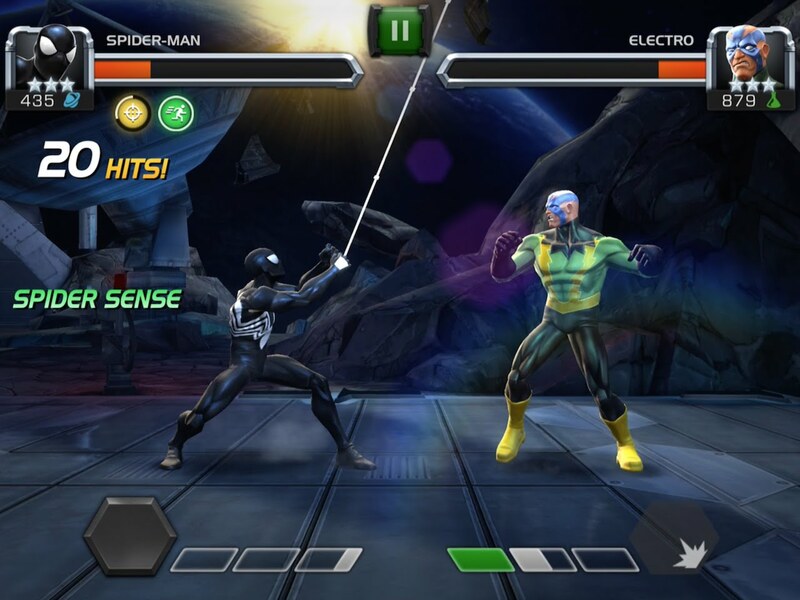 The evade proc can occur event if Spider-Man is blocking. (All Attacks) T’Challas’ fists give way to cat-like claws, carving limitless lacerations in his targets with a 8% chance, each dealing x% of your Attack as direct damage over 7 seconds. (All Attacks) Black Widow strikes her targets with subtle, calculated grace, reducing the chance of triggering their abilities by x%. (When Attacked) With acute sensory perception more attuned than even Spider-Man, Daredevil evades projectiles with a x% chance. (Special Attacks) Arrows strike the jugular with fixed chance to inflict severe Bleeding for the remainder of the fight, dealing x% of your Attack per minute as direct damage. The Bleeding from this ability does not stack. However, you can have one Bleeding from this ability and one Bleeding from his Special attacks. Marine Corps. The Vietnam War. The Italian Mafia. Frank Castle has conditioned himself for high pain tolerance, granting him a x% chance to endure a lethal blow. When the Punisher endures a hit, it brings him to 0 life but he stays alive. His other buffs and debuffs are not affected. He can endure all Specials. The Winter Soldier prolongs suffering with x% increased Attack for each instance of Bleed on the target. The ability boosts him depending on the current number of Bleeds on his opponent. (Passive) Hulkbuster’s armor is reinforced upon receiving damage, increasing up to x% based on lost Health. The perfect counter to the Hulk’s Rage! Rocket makes fur fly up to x% increased Critical Hit Rate for every ten consecutive Combo hits. (Passive) As blows are exchanged, Star-Lord familiarizes with opponent’s techniques, increasing Attack by up to x% with every ten of his Combo hits and Block Proficiency by up to 2.5% with every ten of theirs. The ability considers the current Combo count. As soon as he gets hit, he loses his Attack buff. (When Draining Power) Special Attacks have a 100% chance to disrupt the target, taking x% of their Power as your own. His Special Attacks L1 and L2 drain power as well as burning power. So, x% of the opponent’s Power is drained, and y% of the opponent’s max Power is burnt. (When Attacked) Energy attacks only serve Ultron, who converts x% of the damage into both Power and Health. The Power gain procs at regular intervals, every 30 seconds, with the first proc occuring at the start of the fight. 2 Comments on "Signature Abilities Guide – MARVEL Contest of Champions"
I wish this will be updated from time to time. PLEASE PLEASE UPDATE YOUR GUIDES!!! So far this is the only resource I found that have helped a lot of rookies, in the game of Marvel Contest of Champions, become pretty decent fighters in a short amount of time! Great work in here just keep updating PLEASE! !